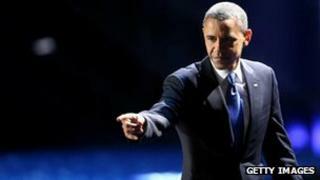 US election: Four more years... of what? Americans voted for four more years of President Obama - but what else did they vote for? How Republicans and Democrats in Washington choose to answer that question will have a major impact on the next four months for the US economy, let alone four years. That's because it will determine how - and how far - they take the country over the so-called "fiscal cliff". The first piece of good news is that the cliff is not quite as large as it looks. The other is that it is not, really, a cliff. Unlike Wile E Coyote, a divided Congress could step over the cliff, look down, and step back onto solid ground again. That is more or less what the "smart money" now expects them to do. But that's not to say there won't be some moments of vertigo on the way. More on that in a moment. But the big economic conclusion that investors have already drawn from the election result is about US monetary policy, not fiscal. Put simply: they think that the US central bank's policy is now going to be looser - for longer - than if Mitt Romney had won. The argument is that Mr Obama is more likely to replace departing "doves" on the Federal Reserve Board of Governors with other doves - ie, people who are more likely to support the current policy of pumping money into the economy for as it takes to bring down US unemployment. Investors also think that there will now be a relatively dovish successor to Ben Bernanke, if the current Fed chairman decides to stand down when his term expires in 2014. These assumptions are probably right - though the definition of "dove" and "hawk" is always a bit simplistic. There are plenty of examples where presidents have appointed Fed governors (or judges) to do one thing, only to see them turn into something very different. Today's monetary dove might, in different circumstances, be tomorrow's hawk. Other things equal, "four more years" of Obama-style monetary policy probably suggests the dollar will be weaker than it might have been under President Romney. That, and the prospect of more years of quantitative easing, may not be welcome news to many emerging market economies, who worry that Ben Bernanke's Fed is sending a wave of cheap liquidity into their already challenged financial systems. Whether it's good or bad news for the eurozone is harder to judge. To have a chance of surviving in its current state, most economists say the eurozone needs growth and the only way it will get that - across the region - is through a weaker currency. Some would say the same about the UK. A weak dollar could make that more difficult. But most important of all to anyone in Europe - Britain included - is that America achieves decent growth. Will that be stronger under President Obama? A majority of voters in the key "swing states" seems to have decided that it will - or at least, they have decided that the risks in Mr Romney's approach to fixing the country's problems outweighed the potential benefits. Crucial to that, however, will be what happens to that "fiscal cliff": the $600-690bn - or 4-4.5% of GDP (depending on how you measure it) in spending cuts, tax rises and other measures that could come in January, if there is no deal between Congressional Democrats and Republicans to stop them. I said the cliff is not as large as you might think. That's because at least $230bn of that $690bn involves regular quirks of the crazy US tax system - like the raising of the threshold for the Alternate Minimum Tax - which always get fixed and almost certainly will be this time. So we're talking about a somewhat smaller cliff of maybe $460bn, or 2.6% of GDP. (Thanks to Kevin Logan at HSBC for pulling some of these figures together). About $125bn of that - the expiry of both President Obama's temporary payroll tax cut and extension of unemployment benefits - will almost certainly go ahead. The administration did not even bother to incorporate them in the President's budget plan. That degree of tightening - about three quarters of 1% of GDP - is unlikely to send the US back into recession. In fact, you might think it the bare minimum, for a country that is still running a federal deficit of more than $1 trillion. The real argument is over the remaining $110bn in spending cuts - including defence cuts which the Republicans hate - and the $200bn or so in tax rises that will happen if the Bush tax cuts are allowed to expire - which Republicans also hate. Democrats are determined to see these tax rises go ahead for households earning more than $250,000 a year, which would raise about $50bn. Republicans are equally determined to stop them - or at least, they have been. Has the result done anything to break the stalemate? Medium term, perhaps. Many in Washington I speak to think the Republican party that emerges out of this very bad outcome will be resigned to higher taxes on the richest households. They may well also be thinking of an election strategy that reaches further beyond their core vote. But there are some basic realities that the "hands across the aisle" scenario has to deal with. One is that almost every Republican member of the House if Representatives has signed a pledge not to raise taxes on anyone. The other is that the president has said he will not delay those automatic spending cuts without a "balanced" 10-year plan to lower the deficit - i.e. one that involves higher taxes on the rich. It's possible that the election has changed the dynamic for this "lame duck" Congress. More likely, though, might be the scenario that many Washington insiders now expect - which is that the $460bn in spending cuts and tax rises are allowed to happen, but then partially reversed, in a deal early in 2013. Why would it be easier to do this in January than December? Because then, Republicans can say they are voting to cut taxes for the majority of Americans, rather than raise them for the rich. That might sound to you like a distinction without a difference. But I suspect you are not a House Republican who has sworn not to raise taxes. Remember, the Republican party retained control of the House. Future Republican contenders for President may draw major lessons from Obama's re-election. It's not obvious that Congressional Republicans will.